Raymond Lee Jewelers also carries a variety of men’s jewelry, including but not limited to men’s wedding bangs, watches from Rolex, Cartier, Breitling, and more, cufflinks, amongst many other types of jewelry. 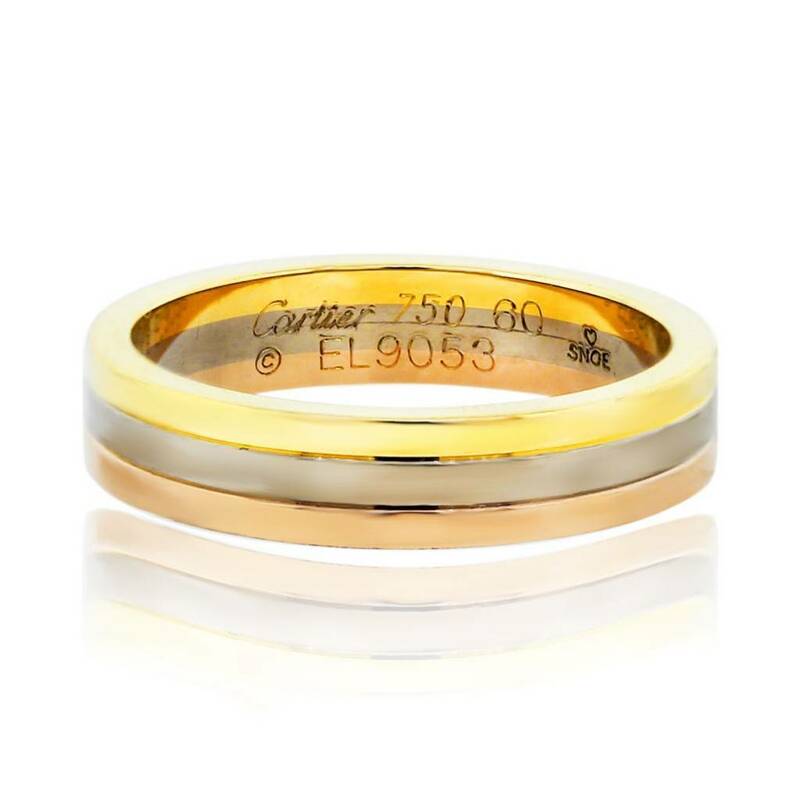 One such example is this Cartier tri color mens wedding band ring. The ring is composed of three 18 karat materials – white gold, yellow gold, and rose (pink) gold. According to Cartier standards, the ring is size 60, but more commonly described as size 9.25. The ring is approximately 0.19 inches wide. Its retail value is $1,700 but you can purchase it from us for only $1,365. If you are a man shopping for yourself, you can also purchase a matching Cartier tricolor ring for your significant other. We carry similar Cartier rings for both men and women. Wedding bands are the perfect opportunity to display your commitment to your significant other. Wear it proudly and loudly. Cartier wedding bands allow you to make such a statement. Many people opt for the more traditional bands that are either white gold or silver, but you can be unique with this Cartier tri color ring. If you are trying to find a matching piece of jewelry, we also carry a variety of Cartier jewelry. We have Tank Francaise watches, Cartier LOVE bangles, which are one of our most popular items, Cartier Pasha watches, Cartier sunglasses, and much more. In the past, we have even carried Cartier pens or additional accessories. The possibilities of jewelry are endless. Please come by our store and take a gander for yourself. We promise that you will be amused by the large selection of beautiful jewelry in our showroom. Categories: Bands without Stones, Cartier, Cartier Rings, Engagement & Wedding | Raymond Lee Jewelers, Gold, Men's Jewelry, Rings, Tri-Tone Gold, Wedding Bands, without Diamonds & Gemstones. Tags: 18k gold, band, Cartier, Mens Ring, Ring, Rose Gold, tri color gold ring boca raton, tri-color, Wedding Band, White Gold, Yellow Gold.